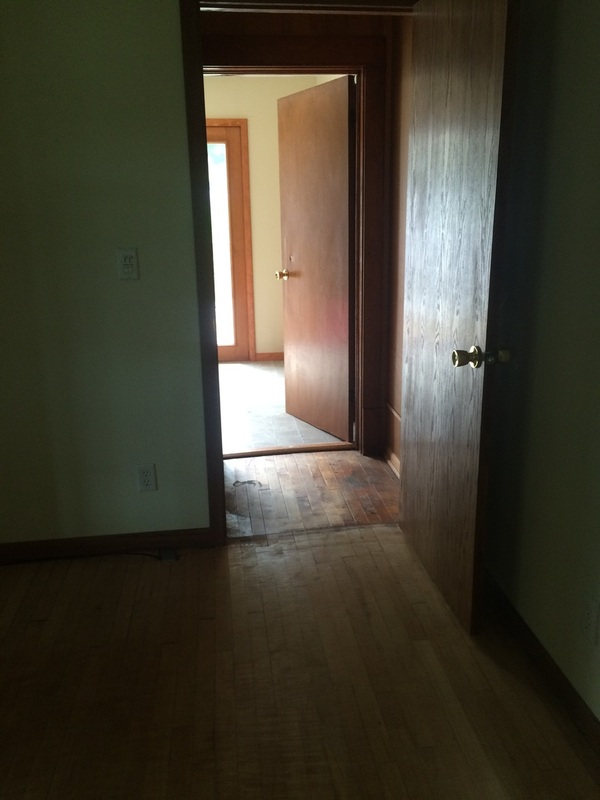 When we first looked at our house back in July, one of the things I loved about it was the original wood floors throughout. I thought they were so beautiful. Most of the house had wood floor with the exception of half of the living room which was carpeted, the stairs leading to the second floor, the kitchen, one of the second floor bedrooms, the bathroom, and the first floor bedroom. I really despise carpet with children and pets, especially white carpet. It ends up getting stained and smelling and cleaning up hard floor is just so much easier then carpet. One of the first things we did when we moved in was to take up the carpet (if that's what you can call it) from the stairway and the upstairs bedroom. The carpet on the stairs was that green indoor/outdoor carpet and the carpet upstairs was really old brown stuff. The indoor/outdoor carpet came out one of the first days we were in the house. The carpet upstairs came out soon after when the kids and I were out of town. J pulled it up and sanded the hardware underneath it. I was so glad to have both carpets out even if the floor underneath wasn't the prettiest. The stairs stayed pretty ugly until about a month or so ago when J took each step off and flipped it over. It is still not the most glamorous but looks a million times better, and they no longer squeak. We will eventually refinish them but we decided to work on the first floor before moving upstairs. The next carpet to come out was the living room carpet. It was white, which looked really nice when we first moved in but add in a new puppy who wasn't potty trained yet, 2 other dogs and 2 children and after Christmas it no longer looked nice at all. I asked J if he thought there was hardwood floor underneath the carpet and he said he was pretty sure there was. So I figured it really wouldn't be a big deal to tear up the carpet. Well Surprise, turns out there was a reason the previous owner carpeted half the living room! Turns out there were two spots that were just covered with ply wood. Our house is old so it was likely where the old registers where. Anyhow, we thought about just sanded the floor and replacing the two spots of plywood but J decided it would be more work than it was worth and we decided to go with laminate floor. What started as just taking out carpet turned into us replacing all the floor on our first floor, except the bedroom and bathroom. J has finished all the flooring except the kitchen thus far, and it looks amazing. It is crazy what a little bit of new flooring can do to a place. It makes the house look bigger and updated in my opinion. Lately, J and I have been thinking about something a little bit crazy. We are talking about canceling our cell phones and just having a land line! *GASP* Hello 1990s! Most of us grew up without cell phones so this really should seem like such a big deal. I think it's a good idea but I still feel nervous about it, which is crazy. We briefly went to prepaid phones about 2 years ago and then after not too long went back to smart phones. I have had a cell phone for the past 12 years! It is kind of hard to remember a time when I wasn't teathered to a phone. And cell phones are so much more than just phones these days. They are cameras, video cameras, calendars, address books, instant access to the internet, kindles, and alarm clocks. We can constantly check Facebook and our email. Sometimes, more often than I want to admit, my cell phone is a distraction. I have a to do list to get done and instead I check Facebook to see what everyone else is up to or I check my email or Pinterest or Instagram. Why are we thinking of getting rid of cell phones? The biggest reason is we pay $150 a month for two smart phones! That is $1800 a year! When you put it that way, it's insane. It seems insane to spend that much money on a phone. Our landline cost $20 a month and internet in our home is $50. We have been talking about cutting costs in our budget and our cell phone bill glares at me. I have cut it down as much as I can without cancelling. The second reason is our cell phones are such time suckers. As I mentioned already there is many times where I find myself mindlessly surfing pinterest or Facebook. Instead of going to sleep or doing laundry or whatever else I need to get done. It is a bit ridiculous. It also keeps us from being in the moment a lot of times. Whenever we feel even slightly bored we turn to our phones. They interrupt time with our family and time with our friends. I think it will be hard to give up my phone cold turkey. I will have to use my alarm clock to actually set the alarm for the morning. I will have to use an actual camera when I want to take pictures. I will have to go back to using a paper address book and calendar. I forgot my phone this morning on my way to work and didn't have it for 4 hours. It was weird but I survived. ​What do you think? Could you ever give up your cell phone? It has been almost a year since I have written in this space. To be honest it felt like an obligation at the time and something I just didn't feel like doing. Lately though I feel like writing again. I miss getting my thoughts out of my head and into words. It can be hard for me to organize my thoughts without writing them out. A lot has changed since the last time I wrote here. We changed what we wanted, yet again, and in September we purchased a house! It has been so amazing to have our own space again. We have been living here for a little over 5 months now and we are still figuring out where we want everything. It is an older home so we are also doing a bit of remodeling and making it our own. So far we have moved bedrooms around three times. We have also moved our TV and Homeschool room three times. We have torn up the carpet in 2 rooms plus the stairs and are in the process of re-flooring the main level. I will likely post before and after pictures eventually. I really feel thankful to have such a handy husband. I also started working at a local library in September. It has been a big adjustment to get used to working again. The job is great, I mean I get to be around books all day, but it is hard being away from the kids. J and I only see each other for maybe an hour a day unless we have the day off. I hope to be back to writing, at least semi regularly. I have lots of ideas floating around in my head so hopefully I can write them down. Today marks day 5 of our reboot. J and I decided to end our reboot after today instead of doing a juice fast for the next 5 days. We decided this for a few reasons and the main reason being it is really hard not to eat carbs in the winter. The 5 days was great though. I haven't had a drop of coffee since Sunday afternoon and only missed it a little. I didn't feel tired at all and didn't hit slumps in the afternoon like I normally do. All the recipes were delicious and I think I will make a few of the soups even when not fasting. We will also try adding a juice into our meals every day. It is a great and easy way to get lots of good stuff in a small package. The reboot also helped get us back on track to eating healthier and making better food choices. I don't think I lost any weight over the past five days but I feel much better. I had more energy which is always nice with kids running around. I am not sure if we will ever attempt the reboot again but if we do I think it will be in warmer weather. We are almost to the end of the third day of our reboot. So far today has been the hardest! My caffeine withdrawal has seemed to pass and I haven't felt exhausted at all today, not even around 2pm when I usually start dragging my feet. Cravings have been out of control today. Not really anything specific but I would love to eat some carbs: bread, noodles, chips. The soups we have been eating are delicious but I miss dipping bread or crackers. Same with salad, I love salad but miss crunch in it with croutons. Usually the first three days are the worst in a detox so I am hoping by tomorrow my body will be used to mostly liquid diet. Yesterday marked the first day of our 15 day reboot. In the first 5 days we are still eating solid foods so it didn&apos;t seem too terrible. The hardest part for me this far is no caffeine! By 2pm yesterday, I was ready for bed. It was also difficult when I missed a meal because I was out of the house and got really hungry. It is much easier to turn down temptation when you are full or satisfied than when you are hungry. I am glad to have day one behind us and excited to start day two. I will be modifying the menu plan a little today. The menu calls for the same Apple bake we had yesterday for breakfast but I didn&apos;t much care for it so I am just going to replace it with a smoothie. The first 3 days are usually the hardest, but we are already half way through! We ended up buying the juice fountain elite by Breville and so far I am really happy with it. It is amazing how it can take a big carrot or Apple and extract the juice from it! I have been feeding the leftover pulp to our horde of bunnies. They seem very happy with it! I am a planner by nature. I love to plan and organize, maybe even too much. Whenever I start something new, or get ready to venture to something new, I love to plan it out. In my last post, I talked about wanting to do a reboot and I will be doing in just not set on a start date yet. I think it is important when doing something that may not be the easiest to set some goals. I need to figure out why exactly I want to do the reboot and what results I expect from it. I want to be clear the reboot is not to lose weight. I am at a healthy weight for my height and body type. I really have no clue what my actual weight is. I don't weigh myself religiously, I don't think that is healthy behavior, and it has been a long time since I have been to the doctor. The reboot is for me to clean my body of all the toxins and junk I have been eating over the last year and the 22 years before that. It's a jump start for me to get back into a plant based whole food lifestyle. helps clear up my skin. I have always suffered from mild acne. It is so much worse when I eat dairy. Recently, I even started to get acne on places other than my face, like my back. I never struggled with body acne before and I am not a fan. give me more energy. There was a time when I only drank coffee because I thought it made me look cool. Since having kids, I went from not even owning a coffee pot to drinking a whole pot of coffee black every morning. I feel the need for coffee even on days when I go to bed early or sleep in late. I love coffee but I want to drink only two cups a day, at most, and not feel drained in the afternoon. Those are my three main hopes. Any other improvements will be a bonus in my book. It seems healthy eating is an addivtive lifestyle for us. Eating whole foods has led us to a new path, a plant based diet. Yes, that is basically vegan. It is unbelievable how bad meat and dairy production is for our environment and our bodies. Watching the documentary Forks over Knives would explain it better than I ever could. Giving up meat will be easy but I may have a harder time with eggs and cheese. I always thought I couldn't live without cow's milk either but since we started buying organic whole milk I don't drink that much of it anymore. It has been over two years since I first starting learning about whole foods and almost two years since we decided to eat completely plant based. I don't remember exactly how long we were strictly plant based but I think it was about 6-7 months. Then we added cheese back into our diet occasionally and eggs, then butter. We still do not drink cow's milk and avoid meat. J will eat venison and loves fish. I eat fish on occasion. Since we have moved in with our in laws, over a year ago, we have been much more lax about what we are eating and it shows. The way I feel both physically and emotionally has gone down hill. I still feel pretty good about how my body looks but I don't have those feel good vibes that I used to when we ate clean. My body has never been Hollywood ideal but I was very happy with it when I knew I was only putting good things into it. The biggest change is probably the mental aspect of it. I am more tired, more stressed, and grumpier. It has been a year of lax eating and I am ready to get back on track. I want to feel good again. It can be so hard to get started. It seems so much easier to buy a frozen pizza than to meal plan and cook nutritious meals. I am lazy at my core of my being. I have to work hard to not be lazy. I need plans and organization. When I don't have a plan, I default to the easiest option. It is also a bit tricky to always have fresh produce on hand here. Our closest grocery store is 13 miles away and our closest grocery store that carries organic produce is 40 miles away. Hopefully, by this spring we will be ready to plant our own garden which will help with the fresh produce. I have wanted to do a detox for a long time, probably since we first started learning about eating whole foods. I have never found one that wasn't too expensive or that really appealed to me. I think detoxes are one of the easiest ways to get back on track with our eating. Clear all the toxins out of your body and start over with a clean slate. Changing the foods you eat, changes the foods you crave but it can be hard to get past those initial cravings. I am so ready to start this plan now but we will be traveling out of town for Bug's birthday next month and I don't know that I want to complete it before that. I haven't decided on an exact start date yet but will soon. I plan on documenting my journey on here. I have never been a big fan of New Year Resolutions. I never make them but I am setting some goals for the New Year, which I guess is kind of the same thing. 1. Finish the Cabin enough that we can move into it. 2. Pay off the majority of our debt. 3. Set up an effective budget for our family. 5. Be more intentional and present. 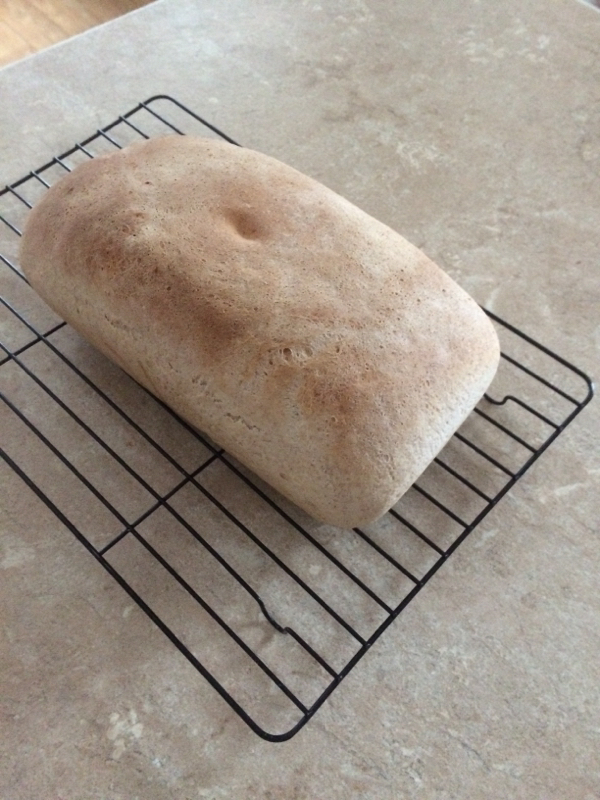 There was a time when I never would have considered making my own bread. There was also a time where I didn't even care what was in my bread. I did always buy wheat bread but I just assumed because it was wheat it was healthy, I never even bothered to look at the label. Well that all changed two years ago. I was no longer blissfully ignorant about what was in our food and started reading labels. Most bread has ingredients labels almost as long as the bag, with things like high fructose corn syrup and potassium bromate. When we first starting trying to eat more whole foods I would buy expensive bread with minimal ingredients and then we lucked out and found a brand with minimal ingredients and a decent price (3 for $5). We bought that bread for over a year but when we moved north I could only find the bread at one store for $2.50 a loaf. 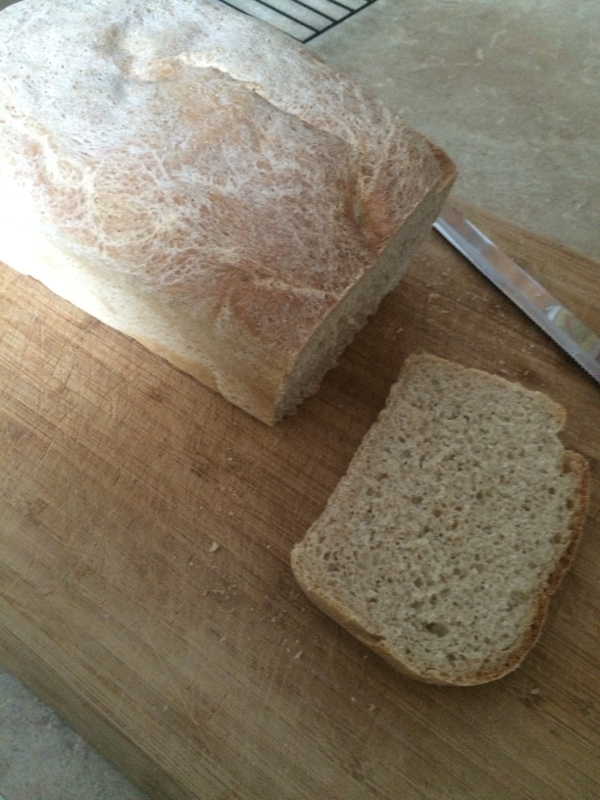 That is when I decided to try my hand at making my own bread. I try lots of recipes that the kids wouldn't eat. I wish I could say my kids didn't have specific tastes but they do, and Bug loves bread. Finally, I found a recipe that the kids enjoyed. I have been using the same recipe for months now and it just keeps getting better, especially now that I have a kitchen aid mixer to do the hard work. 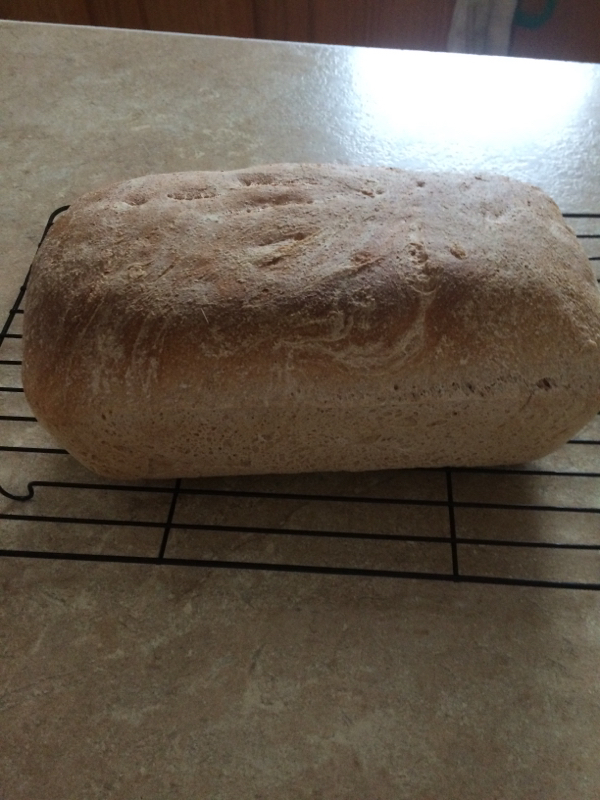 It took a bit of experimenting to get the recipe perfect. I found the original recipe Here. 1. Mix water and yeast in bowl of stand mixer (if you don't have a stand mixer just mix in bowl), let stand for 10 minutes until bubbly. 2. Add remaining ingredients. Kneed for 10 minutes (this is where the kitchen aid makes a huge different) until the dough is no longer sticky. 3. Form dough into a bowl and oil it. Cover and let rise for 1 1/2 hours. 4. Punch down dough and form into a bread pan. Cover and let rise another hour. 5. Bake at 400° for 25-30 minutes. I use our toaster oven and it comes out perfect. 6. Cool out of the pan on a cooling rack. Do not slice until completely cooled. S: twenty-something mother to Bug and Ace, wife to J. Trying our best to live simply and intentionally.